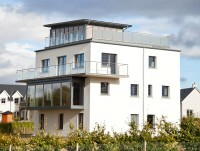 Restoration of the historic building in Scotland has included the installation of StoTherm Classic insulation and a StoSilco external render, and this has transformed the control tower into the impressive centrepiece of a contemporary new residential development. The Category C listed tower stands on the site of the former RAF Findo Gask airfield at Clathymore, near Perth, which was used as a training base for Polish pilots during the war. After a long period of disuse the tower has now been converted into a dramatic new four-storey home by Stephen Country Homes of Perth, who commented that this was a very unusual project and one that demanded the very highest standard of materials and finishes. Using the existing cellular concrete structure meant that the external insulation and render which were used had to be able to accommodate some small degree of movement. Stephen Country Homes found that the StoTherm Classic insulation could achieve this, and could also be applied without the need for any visible movement joints. This allowed the contractor to achieve a high degree of thermal insulation and still create a smooth, uniform external finish with the StoSilco external render, which was applied on top. The cement-free EPS boards of the StoTherm Classic insulation system are ideal for refurbishment projects such as this, as they allow a high degree of insulation to be created for an existing structure without reducing the interior space. The unique Sto-Rotofix Plus fixing system allowed the boards to be installed and then adjusted and levelled to create a smooth and even exterior surface. This was then finished with StoSilco façade render to provide excellent water repellence and resistance to weather. The silicone resin based finish is ideal for exposed locations and aggressive atmospheres and it also offers great resistance to the growth of algae and fungus, thus enabling the finished surface to maintain its original appearance. For this project, Stephen Country Homes were able to choose from the 764 colour options available in the StoSilco Renderrange and create exactly the high-quality final appearance they required. The completed new home will include a roof terrace and a first floor ‘glass room’ extension that provides views across the surrounding Perthshire countryside.